I try to find a way that the public can create the urban space not by architects but by themselves. A common space should offer some flexibility to public, which can be edited. In the end, I imagine the city will be full of lots of positive activities in anytime. I developed an interactive-application program to operate the urban space design. 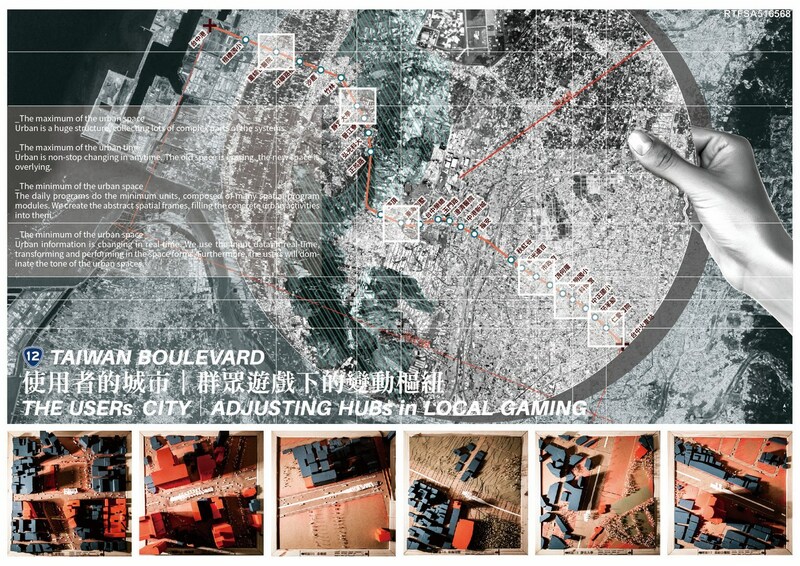 The program include installing open rules, creating the urban context and collecting urban data. 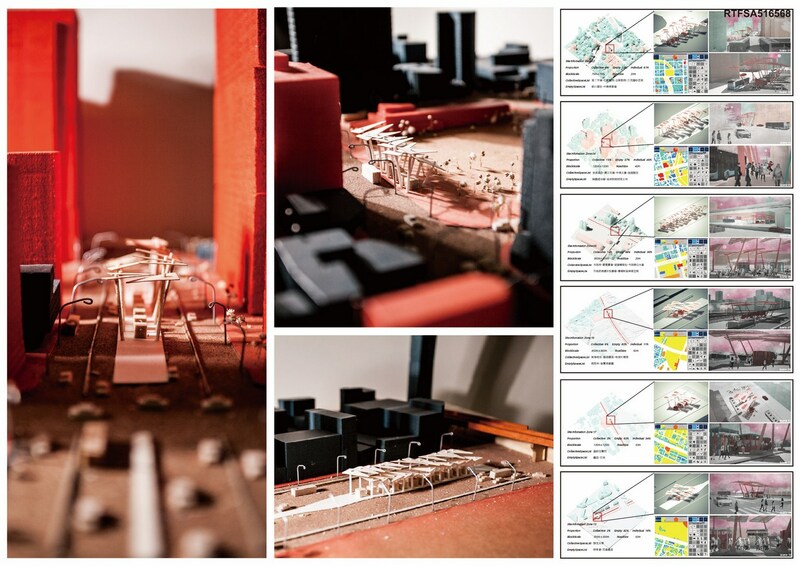 The final result is an interactive bus station design. Urban is a huge structure, collecting lots of complex parts of the systems. Urban is non-stop changing in anytime. The old space is erasing, the new space is overlying. 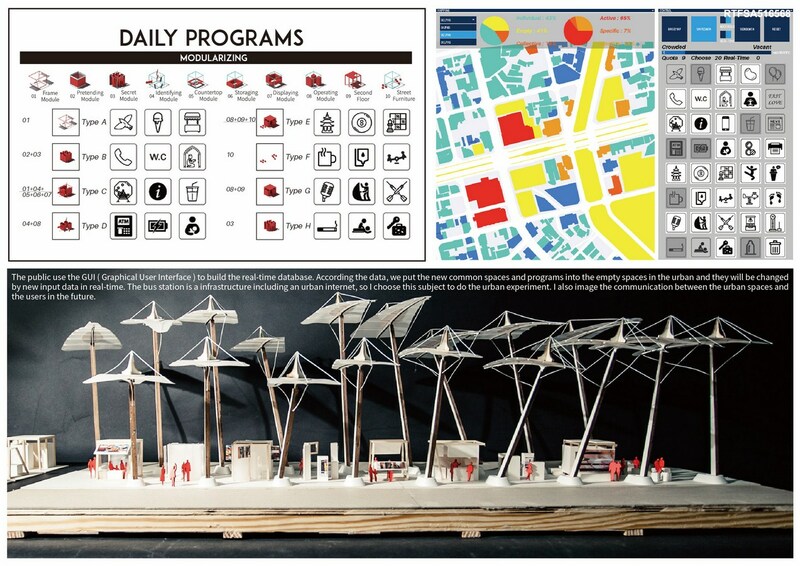 The daily programs do the minimum units, composed of many spatial program modules. We create the abstract spatial frames, filling the concrete urban activities into them. Urban information is changing in real-time. We use the input data in real-time, transforming and performing in the space forms. Furthermore, the users will dominate the tone of the urban spaces. Gaming is a common language for public. We can use this tool to connect the designers and public. The site, Taiwan Boulevard is the main road in the Taichung City ( in the middle of Taiwan ). It starts from the train station ( inside the city ) to the port ( the far suburb ). It also displays the different faces of the city. The city is non-stop extending itself, but it is an empty city. The city is filled with lots of buildings, but there are not enough people to support the spaces. The city lost the users’ mind in the urban space. So I choose the bus stops which on the site, trying to put the main users’ mind together, performing these urban information, building series of the pop-up activities in each urban zone. Finally, it will become a mega-system infrastructure. The public use the GUI ( Graphical User Interface ) to build the real-time database. According the data, we put the new common spaces and programs into the empty spaces in the urban and they will be changed by new input data in real-time. The bus station is a infrastructure including an urban internet, so I choose this subject to do the urban experiment. 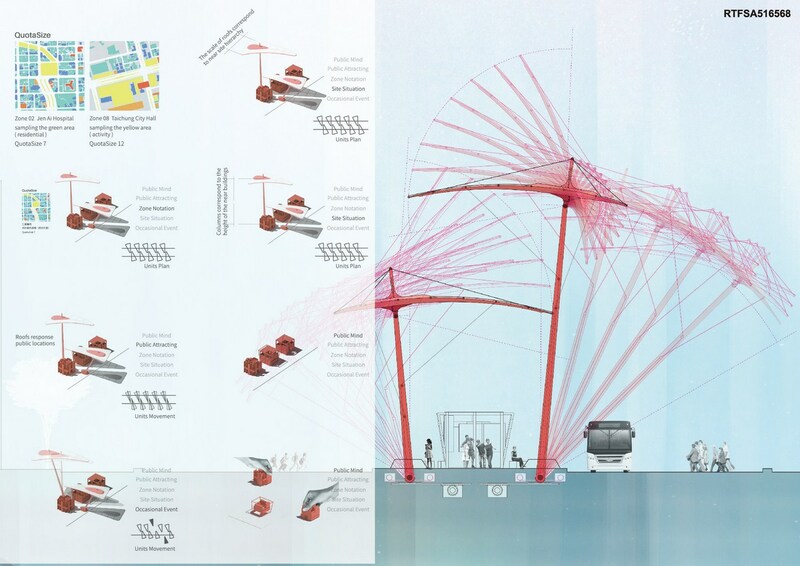 I also image the communication between the urban spaces and the users in the future.